Click on photo for 4-minute Darcy Spears video. Slide right of bell for sound. …but just exactly how did that guy, Frank Komorowski from Williamsville New York, even know about the auction. 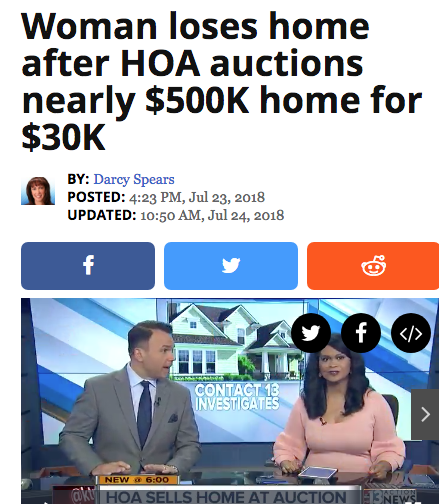 The homeowner and her real estate agent didn’t know it was going to auction and neither did the potential buyer who had an offer on the table. 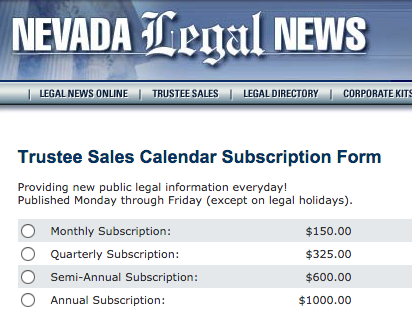 The sale was advertised in the Nevada Legal News, but that seems to be a hard way for a guy off the street to find out about how to take advantage of such a spectacular windfall. Who was notified about the sale? That’s a very good question, and, now my curiosity is piqued. So, to find out, I’m doing a little more public records research. If random guy can make a killing at these mysterious HOA sales, who’s on the losing end of the deal? It’s not just the homeowner that loses. Taxpayers subsidized the sale by his shorting the county on the property transfer tax (Frank paid $153 on each $30,000 sale and instead of the $2,200 that he would have had to pay if he had declared the fair market value. According to Nevada Realtors Association, the property value of each house in an HOA is diminished 1.7% for each foreclosure, but since there are two HOAs mentioned on the foreclosure deed, it’s not clear which homeowners. The homeowners in Summerlin West will pick up the tab for all the attorneys fees while the bank sues Frank and the homeowner sues Frank, and the debt collectors will ride off into the sunset with the $30,000 Frank paid less the nine months of assessments plus interest that the HOA gets. The real estate agent who worked hard on the short sale will be paid zero because the sale was snatched out from under him as well. The bank loses big (unless it’s a bank that’s contributing to the problem by recording false affidavits on titles (but that’s another story for another time). Well, it’s certainly not morally right for HOAs to allow their agents to engage in abusive debt collection practices. Doesn’t the law limit collection fees? Yes. It’s definitely not legal to keep money that’s not yours. NRS 116.31164 says exactly how the proceeds of an HOA sale are to be distributed. The debt collectors just don’t do it. Keeping all the money (except nine months of assessments to the HOA plus interest) is just about all they distribute because they have been getting away with it. When there is so much money to be made by cutting corners and playing fast and loose with the rules, lots of people who are supposed to be fiduciaries go to the dark side. SCA is no better. SCA has been ripped off by EVERY ONE OF ITS DEBT COLLECTORS, to a greater or lessor degree, since 2014 (that I know of, for sure). For example, in April, 2015, SCA hired some very crooked attorneys, Alessi & Koenig, LLC, as debt collectors, after SCA dumped Red Rock Financial Services (who was really SCA managing agent FSR in disguise). When the A & K bankruptcy was dismissed, and the creditors were told to pound salt, it looks like the attorney/debt collectors had kept $2.6 million out of $2.9 million they admitted receiving in HOA sales proceeds. And there’s a multi-million dollar mansion in David Alessi’s sister’s trust’s name in Malibu (unless he’s picked a new place to hide assets from creditors). Retained quite a bit over the legal limit, I’d say. More to come about the exciting ways HOA agents make the big bucks for a few lucky winner while the HOA homeowners foot the bill.